There are a lot of myths about teeth whitening floating around the Internet, and those myths come with many questions. Is whitening bad for your enamel? Are there natural remedies? If I want to whiten my teeth, should I do it professionally or at home? Should I use whitening strips or whitening toothpaste? Do they actually work? We at quip are here to answer your questions, and discuss how whitening can affect your oral health! While it is true that teeth can lose some of their pearly white shine due to stains from dark drinks like coffee, soda, and tea, this is easily removed with regular brushing or during your regular trip to the dentist if you have let it go a little far! The most common reason for yellow teeth is below the surface. Underneath the outside layer of enamel is a yellowy core called dentin. As your enamel wears from acidic foods, grinding teeth, scuffs and natural aging, this yellowy layer gets closer to the surface, making your teeth appear more and more yellow. Genetics also plays a strong role in the yellowness of your dentin, or thinness of your enamel. One of the most important things to know right away is that method 1, using chemicals, is not only more effective and long lasting, but when done correctly, is far less damaging. The core problem with abrasive based whitening is that it will only work on surface stains and will not do anything to affect your dentin, below the surface. More worrying is that if used incorrectly, you can actually damage the enamel and irritate gums using this abrasive, which is not only unhealthy, but could actually speed up the yellowing of teeth! Toothpastes are a great example of how the industry is split into these two methods of whitening, and also a great example of the “less honest” side of it. In short, very few dentists recommend ANY type of whitening toothpastes because they have little to no effect. On the bleaching side, there are some toothpastes containing the right sort of chemicals that can in theory whiten, but as Dr. Burhenne points out, they’re not exposed to the teeth long enough to have any effect! “Whitening chemicals need to be in contact with the teeth for a minimum of 20 minutes in order to affect a color change,” he says. And some even for hours! On the abrasive side of the market (notable by the cheaper price tag on shelf), according to the ADA, these whitening toothpastes only remove surface stains with physical abrasives and Dr. Mark Burhenne, quip’s Chief Dental Advisor, warns not to be fooled by toothpastes that promise “professionally whitened teeth!” He compares the abrasives in whitening toothpaste to using sandpaper on your teeth. “I don’t recommend these toothpastes because they remove tooth structure by scraping away dentin and enamel,” he says. In summary, these toothpastes are chemically the same as most regular toothpaste, but “rub harder” on teeth, which can be damaging and will have little to no effect. 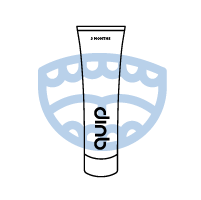 Bleaching products contain chemicals such as carbamide peroxide and hydrogen peroxide. 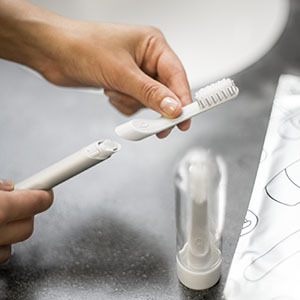 When using these chemicals, one should be prepared for side effects like tooth sensitivity, as they must go through the enamel to whiten the tooth from the inside-out, or mouth sores on the gums, particularly when whitening strips come into contact with your gums. Dr. Burhenne suggests using custom whitening trays instead of strips to avoid contact with your gums and to better reach the curves of your teeth. Overall, these are far more effective than toothpastes could ever be, just be careful and use based on your own dentist’s advice. You may be wondering about natural remedies you’ve seen bloggers rave about on Pinterest, like using hydrogen peroxide or lemon juice. Dr. Burhenne says these remedies not only don’t work, but can poorly affect your dental health. Professional whitening begins to sound like the better option, but Dr. Burhenne strongly advises against it if you want lasting results that don’t cost hundreds of dollars. Professional whitening uses 25 to 40 percent hydrogen peroxide with some sort of light or laser, which companies say speed up or activate the whitening process. But most studies report that there is no long-term benefit with these light-activated systems. In a report by the American Dental Association, officials say “professionally applied bleaching products are no longer eligible for the ADA Seal of Acceptance.” The ADA highly suggests that you speak to your dentist about options for whitening to prevent extensive damage. Dr. Burhenne says the safest way to whiten your smile using bleaching products is to use whitening strips or gel, as directed by your own dentist, and to do it slowly. Extensively bleaching your teeth can cause damage to your enamel, but controlled use should not affect your enamel. One myth is that using a higher potency of whitening gel, like you would find in a professional dentist’s or hygienist’s office, but Dr. Burhenne recommends using a low potency whitening gel over several weeks to get the best results. One of the best ways to achieve a whiter smile is to simply take consistent preventative care of your teeth. 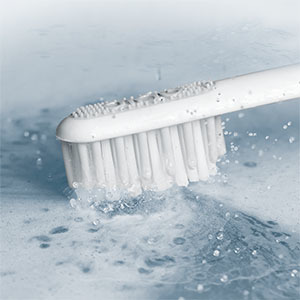 By brushing gently, twice a day, covering all surfaces of your teeth over a full 2 minutes you will be able to keep the surface stains away, completely removing the need for the potentially damaging, abrasive toothpastes. 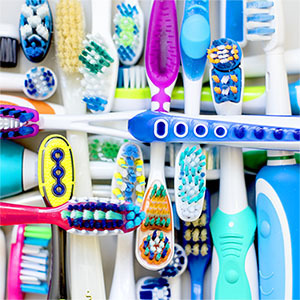 This is also another great reason to avoid the more powerful brushing modes and to never use medium or hard bristles, as anything that can abrade away enamel is slowly bringing the yellow dentin to the surface. want a whitening free toothpaste?